On Jan. 6, 2015 at about 7:30 P.M., plaintiff entered a Ralphs Grocery store in Los Angeles. 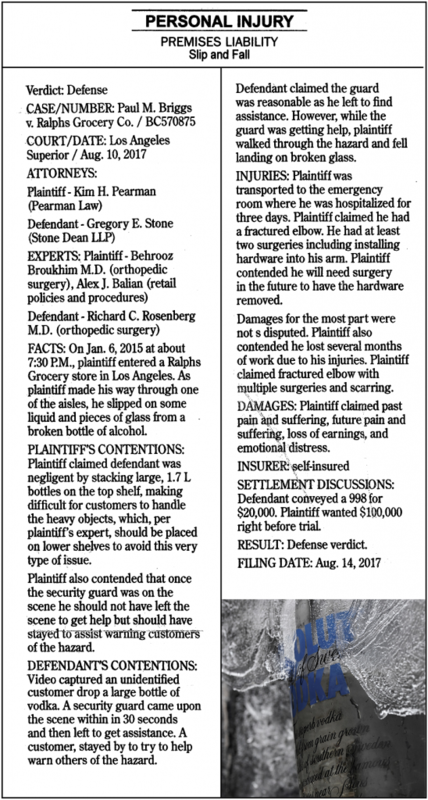 As plaintiff made his way through one of the aisles, he slipped on some liquid and pieces of glass from a broken bottle of alcohol. Plaintiff claimed defendant was negligent by stacking large, 1.75L bottles on the top shelf, making difficult for customers to handle the heavy objects, which, per plaintiffs expert, should be placed on lower shelves to avoid this very type of issue. Plaintiff also contended that once the security guard was on the scene he should not have left the scene to get help but should have stayed to assist warning customers of the hazard. Video captured an unidentified customer drop a large bottle of vodka. A security guard came upon the scene within in 30 seconds and then left to get assistance. A customer, stayed by to try to help warn others of the hazard. Defendant claimed the guard was reasonable as he left to find assistance. However, while the guard was getting help, plaintiff walked through the hazard and fell landing on broken glass. Plaintiff was transported to the emergency room where he was hospitalized for three days. Plaintiff claimed he had a fractured elbow. He had at least two surgeries including installing hardware into his arm. Plaintiff contended he will need surgery in the future to have the hardware removed. Damages for the most part were not disputed. Plaintiff also contended he lost several months of work due to his injuries. Plaintiff claimed fractured elbow with multiple surgeries and scarring. DAMAGES: Plaintiff claimed past pain and suffering, future pain and suffering, loss of earnings, and emotional distress. 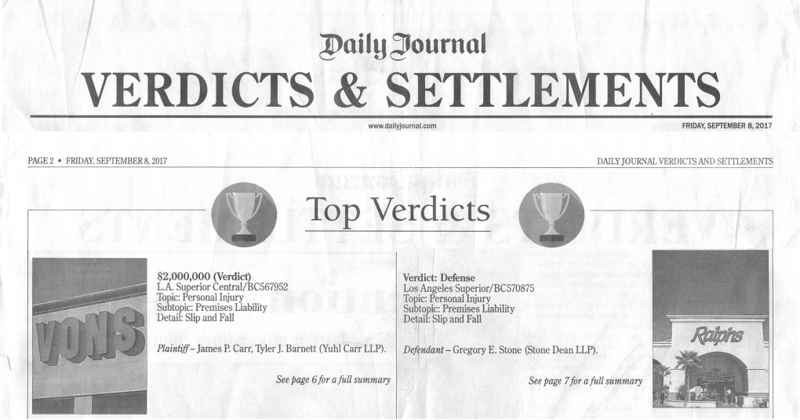 SETTLEMENT DISCUSSIONS: Defendant conveyed a 998 for $20,000. 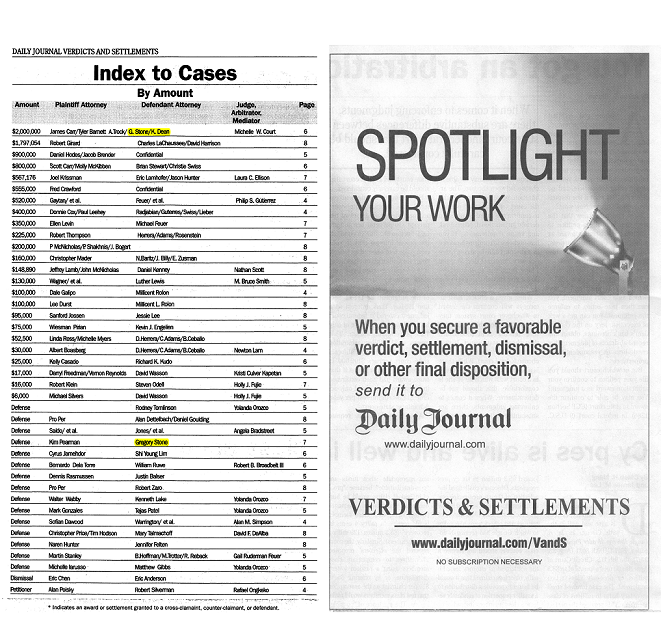 Plaintiff wanted $100,000 right before trial. On Nov. 12, 2013, plaintiff slipped and fell in a Von’s market in Culver City, when she stepped into a large puddle of water near a refrigerated cake cooler. The cooler was serviced pursuant to a contract by co-defendant Hussmann, Inc. The cooler had been serviced within 24 hours prior to plaintiffs fall. Plaintiff disputed whether Hussmann Service technician warned Von’s Store Manager that cooler may continue to leak for some period of time. No warning signs or cones were in place at the time of the fall. Defendants claimed that the puddle was too large to have been created by a leak from the cake cooler because any such leak would be limited to a slow drip of condensation, and any resulting puddle would be very small. In addition, Von’s claimed no notice of any ongoing leak or puddle, and that a sweep had inspected the subject area of the store shortly before the fall with no puddle found. 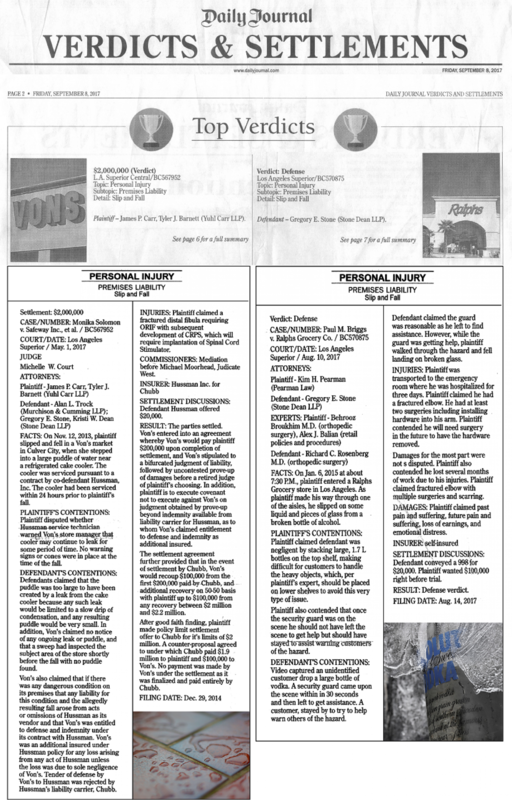 Von’s also claimed that if there was any dangerous condition on its premises that any liability for this condition and the allegedly resulting fall arose from acts or omissions of Hussmann as its vendor and that Von’s was entitled to defense and indemnity under its contract with Hussmann. Von’s was an additional insured under Hussmann policy for any loss arising from any act of Hussmann unless the loss was due to sole negligence of Von’s. Tender of defense by Von’s to Hussmann was rejected by Hussmann’s liability carrier, Chubb. Plaintiff claimed a fractured distal fibula requiring ORIF with subsequent development of CRPS, which will require implantation of Spinal Cord Stimulator. COMMISSIONERS: Mediation before Michael Moorhead, Judicate West. SETTLEMENT DISCUSSIONS: Defendant Hussmann offered $20,000. The parties settled. Von’s entered into an agreement whereby Von’s would pay plaintiff $200,000 upon completion of settlement, and Von’s stipulated to a bifurcated judgment of liability, followed by uncontested prove-up of damages before a retired judge of plaintiffs choosing. In addition, plaintiff is to execute covenant not to execute against Von’s on judgment obtained by prove-up beyond indemnity available from liability carrier for Hussmann, as to whom Von’s claimed entitlement to defense and indemnity as additional insured. The settlement agreement further provided that in the event of settlement by Chubb, Von’s would recoup $100,000 from the first $200,000 paid by Chubb, and additional recovery on 50-50 basis with plaintiff up to $100,000 from any recovery between $2 million and $2.2 million. After good faith finding, plaintiff made policy limit settlement offer to Chubb for its limits of $2 million. A counter-proposal agreed to under which Chubb paid $1.9 million to plaintiff and $100,000 to Von’s. No payment was made by Von’s under the settlement as it was finalized and paid entirely by Chubb.